Bonjour fello winos! Today I decided to try to trick my dad into liking french wines. Not just any french wines, cheap/inexpensive french wines. Does such a thing exist? We shall soon find out. I bought this bottle about a year ago for around $20, the same time I bought the Cheval Noir. Fancy pants name, let me break it down for you. 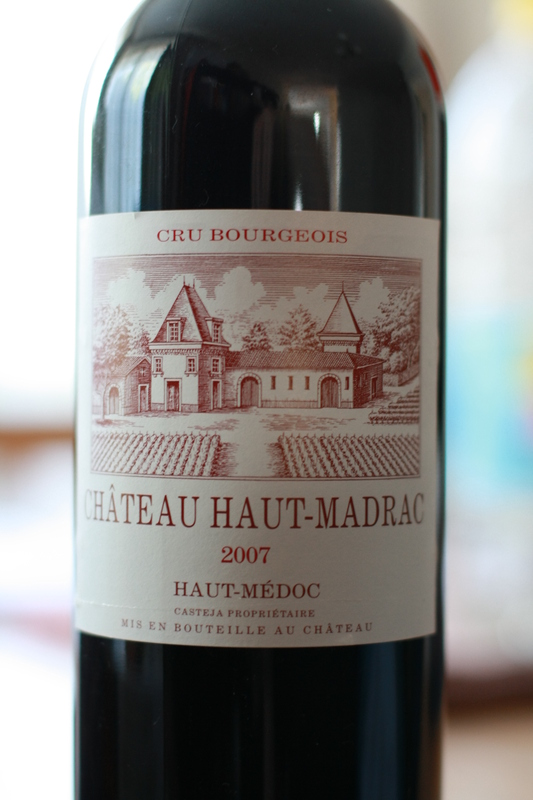 Chateau Haut-Madrac just means it’s from such and such a place. It also tells you that it’s from Medoc appellation meaning left bank Bordeaux, which leads you to think Cabernet blend (this is 70% Cabernet Sauvignon, 30% Merlot). It also says “Mis en bouteille au Chateau” which means, and I’m sure you’ve guessed, bottled at the Chateau. The last thing is Cru Bourgeois which translates to table wine and thus not having to abide to any requirements. So, how did it fare? Very dusty nose, deep green earthy flavours with a raisin like fruit characters. very old and leathery and black tea. The attack on this wine is mild with some fruit acidity and then some sweet and spicy notes like sweet paprika. There is also a mix of bitter and tannic notes towards the end, think of burnt wood and that black tea. There is not much difference to the initial taste and the mid palate, only that you get some black coffee flavours coming through but its firm and bold in structure throughout. Finish is very long and lingers, little bit grippy on the mouth and some orange rind. If you have had chinese red bean desert and get that little hint of dried orange peel you know what I mean. It also has a dusty finish but the dust is very brief but noticeable and doesn’t stick to your mouth. Its gives off the illusion of an aged and old wine and you have to double-check the label to see its an 07. This guy was double aerated and decanted for about 30mins. definitely would have liked more time in the decanter since I liked it more and more as I drank this. Initially I would have said it’s a bit simple in favours but these tea and coffee with some of the raisin fruits get in there after a while. I think it was a surprise of a wine, I think I expected less from it. I think it’s probably worth the price tag but I think some of the italian blends are better value at this price point. Initially my dad didn’t like it, too tannic and dusty but as the night went on, he got more and more of these old leather, burnt wood and coffee/tea notes which you don’t find often in younger wines which I think piqued his interest. A good start.